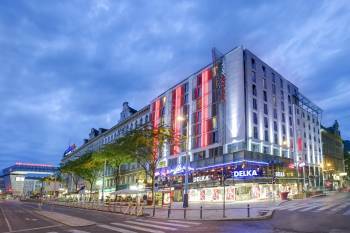 Only a stone’s throw away from Vienna’s West Station, the Intercity-Hotel Wien is centrally located on the Mariahilfer Straße, a busyshopping street with underground, bus and tram connections directlyin front of the hotel. Good to know that the FreeCityTicket for localpublic transport is already included in the room rate.The comfortably furnished rooms are ideal for relaxing after a strollthrough Vienna. Next morning, the abundant breakfast buffet makesyou fit for the coming day. Later, the restaurant team indulges youwith dainty and tasty delicacies. They can be heartily enjoyed inthe 80 sqm brightly daylit conservatory, which is directly linked tothe restaurant. The IntercityHotel Wien is your specialist for Green Meetings bySteigenberger & IntercityHotel. The comprehensive and sustainableGreen Meetings concept is based on proven partnerships and certifiedsuppliers. In cooperation with “atmosfair” we organize your eventin a CO2 neutral compensated way supporting the research, developmentand expansion of regenerative energy.In addition to daylight illumination and modernpresentation technology, our six conference rooms,which partly can be combined with one another,always provide the right background for your eventup to 100 people.